Since Kristin got back from Petra (glimpses of her trip are here), we’ve been busy checking the page proofs of the third edition of Film History: An Introduction. It’s due out in February and we have to go over the whole enormous thing, since we’ve made adjustments to almost every chapter. There will be updates of several chapters, as well as two new chapters taking into account developments since our last edition (written in the fall of 2001). We’re also expanding our Notes and Queries supplements, which will appear online. Already our new introduction, discussing some approaches to historical research, is available elsewhere on this site. This task hasn’t given us much time for blogging. Now, though, we are in a small hiatus before the final push, so each of us hopes to finish a blog entry this week. Kristin will write about a recent visit to Madison of Stefan Droessler, head of the Munich Film Archive. 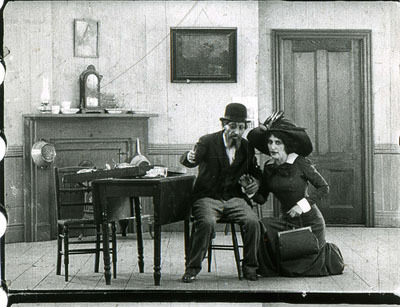 He gave lectures and screened a reconstructed Lubitsch film, The Wife of the Pharaoh (1922). My entry will focus on Wong Kar-wai’s Ashes of Time Redux. I hope to point out some interesting differences among the versions of this remarkable movie. But to keep your eyes warm, three quick items of note. I probably don’t have to urge you to see the new Criterion edition of Chungking Express, out in both standard and Blu-ray editions. It’s the Miramax/ Rolling Thunder version, in a crisp transfer with a nice range of color and detail. (I don’t have Blu-ray and so can’t report on that disc.) There’s also a precious 1996 British TV episode in which WKW and a beer-guzzling Chris Doyle tour some Hong Kong locales we see in the movie, tossing out technical information along the way. 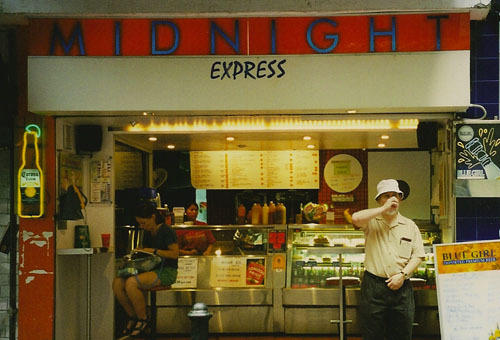 The show also supplies a more or less documentary record of the Midnight Express fast-food counter a couple of years after the film. Still later, the success of Wong’s film led the owner to upgrade it, with results you can see at the end of this entry. In the supplementary short, Chris Doyle catches himself talking like a critic and says it’s because “I’ve been reading Tony Rayns.” Not by chance, the Criterion set includes a superb commentary track by Tony, who has worked closely with Wong and Doyle for years. Tony’s fluent discussion anticipates practically every question you might ask about the movie, including why Faye Wong wears a United Airlines uniform. Chungking Express is my favorite of Wong’s work, but that’s not the main reason I devoted a chapter to it in Planet Hong Kong. I think it’s an important film historically. In the context of Hong Kong cinema, it was as much a breakthrough as was Days of Being Wild, but its offhandedness made it seem more innocuous. Wong makes daring use of plot structure: two stories, barely linked, that connect thematically rather than causally. (We also examine this aspect in one section of Film Art.) 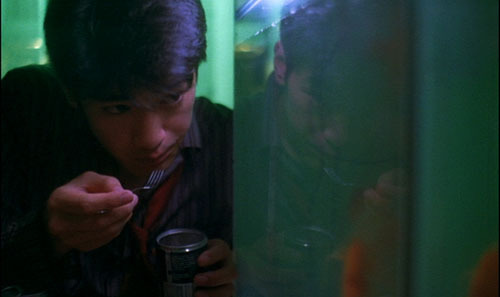 Further, Chungking Express is an exhilarating instance of a type of storytelling that fascinates me, what I call “network narrative” and that I analyze in one essay in Poetics of Cinema. Finally, because this film was more widely seen than Wong’s earlier work, it identified him with a particular style: dazzlingly composed shots alternating with smeared and rushed ones, pulsations of saturated color, precise matching of image to music, and a tone of wistful romanticism. Who else could make such an engaging movie about two guys whose girlfriends have left them? 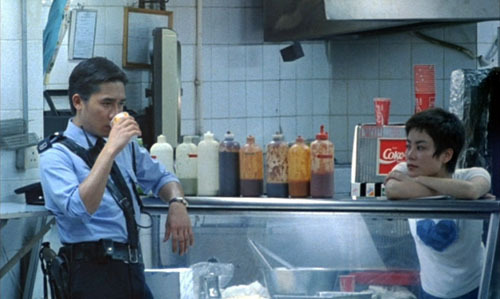 Across his career, Wong’s technique has been more varied than the flash-and-grab breeziness of Chungking Express, Fallen Angels, and Happy Together suggests. The blurred imagery and stuttering slow motion proved easy to mimic and even parody (in Wong Jing’s Whatever You Want, 1994). In the Mood for Love and 2046 returned to the more precise and controlled staging, the nearly abstract use of setting, and the tight close-ups of Wong’s earliest films. 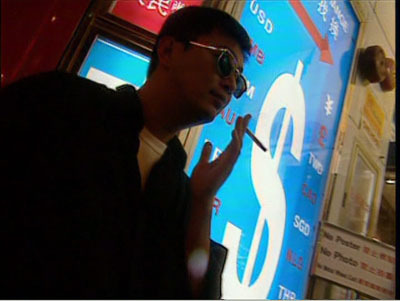 For all their virtues, though, these late movies lack the sheer ingratiating zest of Chungking Express. If My Blueberry Nights disappointed you (as it did me), revisit the original and watch it jump off the screen. Keep an eye peeled for those reflections. 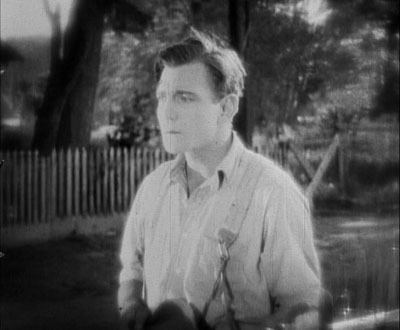 Speaking of new DVDs, today the UPS man lugged a Fox Murnau/ Borzage box to our door. This cost more than my first car (and weighs about the same), but it’s a better bargain. My oil-leaking ‘62 Impala did not come fully loaded with Sunrise and City Girl and Seventh Heaven. Dedicated Fox archivist Schawn Belston has labored hard to create this remarkable collection, as robust a contribution to our understanding of film history as his Ford at Fox box a year ago. Tucked inside the chocolate-colored case are twelve films and two handsome books with texts by Janet Bergstrom. An entire book is devoted to the lost Four Devils, and one disc houses a lengthy documentary on the two directors. Many of the early thirties Borzages are new to me, and I can’t wait to see them. But Kristin and I are very happy to have two lesser-known titles that we love, Lucky Star (1929) and Lazybones (1925). The latter is a striking example of the trend toward the “soft style” of cinematography that swept Hollywood in the 1920s (and that Kristin analyzes in The Classical Hollywood Cinema). Even men were shot with filters, gauzes, and selective focus, creating lyrical images like the one of our hero above. The soft style was about as popular then as the dark, earth-and-steel tonalities we find in so many films today. When our travails with Film History are ended, we look forward to digging into this new Fox treasure chest. The Nitrate Film Interest Group of the Association of Moving Image Archivists has put together a page on flickr where archivists can post images of unidentified films. The submissions have tended towards silent films and nitrate prints, but sound films and safety elements are welcome as well. The page is also set up for short video clips, and the first video post has just been uploaded from a new scan of a 28mm print in the Academy Film Archive’s collection. This is also a good resource for anyone out there seeking help in identifying film elements, and you do not have to be a member of AMIA to submit images. This is a remarkable site, and the images are tantalizing. As of this writing, several films have already been identified. So, three snacks to tide us all over. Check in later this week for some new stuff, when our eyes will focus again. This entry was posted on Monday | December 8, 2008 at 10:51 pm	and is filed under Asian cinema, Directors: Wong Kar-wai, Film archives, Film comments, Film history, Film technique, Narrative strategies, National cinemas: Hong Kong. Responses are currently closed, but you can trackback from your own site.